To trade options, you first need to request permission to buy "naked" calls and puts at your brokerage. This means you want to speculate on the direction of a security rather than hedge a current holding. Our recommendations will consist of four elements: A security (stock or ETF) name; the month and date of expiration; the strike price; the buy limit order; the target limit order; and the stop order. A typical order will state, "Buy Apple November $100 calls at $2.20 lmt gtc. If filled, sell target $3.10 and set a stop at $1.35." This is an options trade "ticket" at Interactive Brokers. 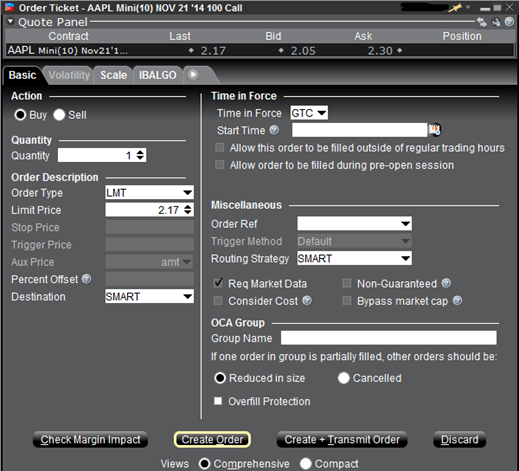 Note that the header shows that an AAPL November 21 100 call has been selected. The bid/ask is $2.05 / $2.30 and the last price is $2.17. To create the order, put the recommended limit price in the appropriate blank, type in the quantity of contracts you wish to buy, select GTC (good until canceled) for time in force, then press Create Order. You will then have an opportunity to review the order before transmitting it.